An Electric Motor Power Loss and Heating occurring in its various parts such as copper losses occurring in armature and field and eddy currents in the magnetic material used as a core, and mechanical losses due to friction and windage. These unavoidable Electric Motor Power Loss cause localized heating and are responsible for temperature rise of the motor. The heat flows from the point of origin to the external surface where it is dissipated to the surrounding cooling medium. Hence, heating and temperature rise of an electric machine are a function of the losses occurring in it. x = load on the motor expressed as a fraction of rated load. If there is no cooling and the machine cannot dissipate heat to the external medium its temperature increases to a very high value. Hence, it must be provided with cooling to limit the maximum temperature rise to a permissible value, depending upon the class of insulation employed. The heat generated in the machine is dissipated to the surrounding cooling medium. However, a portion of heat is stored in the material itself causing a temperature rise. In the beginning all the heat is stored in the material and no heat is given to the medium. As the temperature rises, the component of heat stored decreases and the component of heat dissipated increases. Finally when the machine attains a steady temperature it can no longer store any more heat and all the heat generated is dissipated. Under these conditions the temperature remains constant, heat generated being equal to heat dissipated. The time taken by the motor to reach these final steady-state values depends upon the effectiveness of cooling. If a machine is well ventilated it reaches the steady-state quickly. If the machine is switched off or its load is reduced it cools. It cools to the ambient temperature when it is switched oft in the second case of temperature rise drops to a lower value, corresponding to the new load. An electric machine is normally designed for a given temperature rise as decided by the class of insulation used. The design rating of the motor is called its continuous rating because the final steady-state temperature rise of the motor is within permissible limits if the machine delivers the power continuously over an extended period of time. In case a machine operates at a temperature higher than the specified one this result in thermal breakdown of the insulating materials. This may not occur as an immediate consequence, but deteriorates the quality of insulation used and reduces the life of the motor. 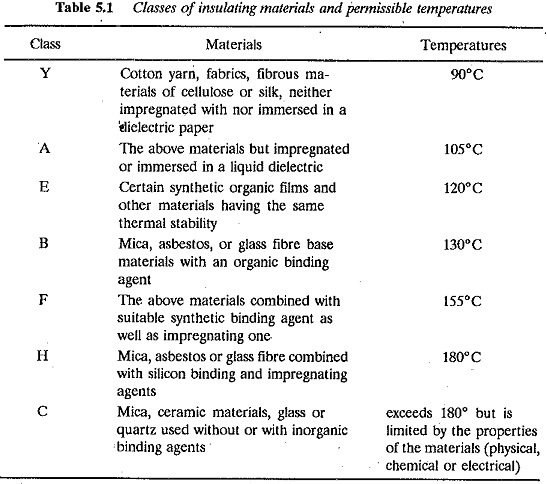 The Classes of insulating materials and their permissible temperatures are given in Table 5.1. An electric machine has sufficient overload capacity. The thermal restric­tions as stated above do not allow a continuous overloading of the motor. This is because the losses rise more steeply than the power. The corresponding fi­nal steady-state temperature rise is also more. However, there is a time lag between the losses of the motor and resulting temperature rise. This allows a overloading of the motor for short periods limiting the final temperature rise to the permissible value. Several classes of duty of an electric motors are possible. Before discussing these classes of duty and selecting a suitable motor rating for a given class of duty let us discuss in detail the heating and cooling of an electric motor under the influence of losses.